The company says the new lights are designed to enable control and switchgear manufacturers to provide lower light output for smaller enclosures - the 600-lumen version meets the standard requirement for the large TS 8 enclosure while the 400-lumen lights are suited to wall-mounted enclosures, such as the Rittal AE compact enclosure series. 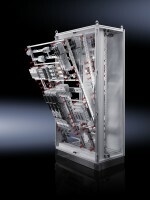 RITTAL, a leading global provider of solutions for industrial enclosures, power distribution, climate control and IT infrastructure, has announced further improvements to its ISV distribution enclosure - part of the Ri4Power range and says it has upgraded the installation kit allowing the ISV modules to be integrated faster and more easily into the TS 8 and SE 8 enclosure systems, and into the AE compact enclosure. RITTAL says we live in a world of rapid change, driven by the growth of ‘smart technology’, automation components are becoming more compact, both for centralised and decentralised applications, while still delivering considerable computing power and sensors and actuators are also getting more ‘intelligent’.